book - Nitya Puja – Akhir Kyon? kaise? Aur kya? 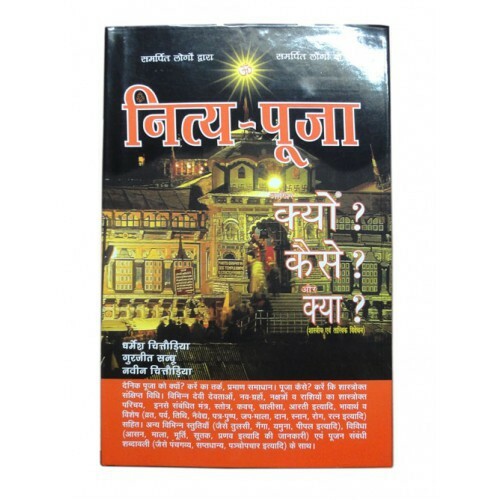 Book - Nitya Puja Aakhir Kyu? Kaise? Aur Kya? Nitya Puja – Akhir Kyon? kaise? Aur kya? Price: 250/-, Pages: 222, Paper used: Matt-130gs..
Nitya Puja – Akhir Kyon? kaise? Aur kya? Price: 250/-, Pages: 222, Paper used: Matt-130gsm, Cover-Gloss-170gsm, Laminated; Binding: Hard Bound Perfect with section swing. What is the Theory of principle of karma (Action) ? Why should we do Daliy Worship and What and How should we do this? What are ‘Gyan Marg’ and Bhakti Marg ‘ and ‘Karma Marg ‘ ? We have to bear the results of all our deeds/actions, when this is true, how can we get whatever we are not destined for (as per our past deeds/action) through worship (puja), meditation, sacrifice/home (yagya-hawan) etc. ? In worldly life, actions have to be done and their corresponding results have to be borne, then how is it possible to get salvation or mukti? What is the relationship of the Navagrahas (nine planets) with the life of a common man? If God loves/desires devotion (Bhava) only, then what is the role of lamps, incense sticks, homas etc. For logical answers to these type of scores of question, please refer the book Nitya Puja Akhir Kyon? kaise? Aur kya?’ from Global Voice Publishers and enjoy the benefits of throughly studying this book. Some other specialties of this book. Mantra, Storta, Stuti with introduction, meaning and specialities of prominent Gods and Goddess (like special occasions, dates, stivals,fasts, fruits-sweets, flowers, garlands, planets etc associated with each God/goddess). Collection of Chalisa and Aarti of each main God/Goddess (alongwith why and how details). Peepal, Ganga, Yamuna, Cow, Bad Dream effect elimination etc. related brief/small stuti/mantras etc. How to chant Mantra, Stotra etc.? Which Asan (seat), Mala (beads) etc. to use?. All such details in brief are given. Meanings of significant words like ‘Panchagavya’, ‘Panchamrit’, saptanaz etc. and what they compose of.